Just in case, I responded to your comment on the the Murakami mon with a 'loop' on the previous page. Great I will try to get hold of that book and check it out myself. How are you nowadays? The material accumulated here is enough to publish a booklet. And fully deserve it. The illustration of banners for the first one is almost complete, covering the rise and fall of Takeda Shingen. Over 100 sets from Kai, Suruga, Sagami, Shinano, Kozuke and Echigo. Battlefield scenarios of 4th Kawanakajima, Mikatagahara and Nagashino are being illustrated to show how the banners were used. The cut-off for banners show Otate no Ran and Temmokuzan. I've intentionally left out the Oda and the Tokugawa for later projects. But I am trying to find out the early versions of some of those who served Ieyasu to recreate the army of Imagawa Yoshimoto. Page 1: Okubo butterfly sashimono have been updated. Kakizaki Kageie, one of Uesugi Kenshin's '28 Generals'. Led the vanguard at 4th Kawanakajima and charged into the contingent of Shingen's brother Takeda Nobushige who was killed in the ensuing battle. The 'Praying Mantis' uma-jirushi and 'Radish' sashimono appear in color plates in Turnbull's 'Samurai Warlords' and Osprey's Kawanakajima Campaign book. The first 'Radish' uma-jirushi appears in a color plate in a Rekishi Gunzo book which feature one of the Kawanakajima Screens where the standard can be seen. The second 'Radish' Uma-jirushi and the wild boar standard appear in the compilation book of 100 heraldry sets. The wild boar standard can also be seen in the Kawanakajima screen. Honjo Shigenaga, one of Kenshin's 28 generals. Often troublesome, defying and disobeying Kenshin. At the 4th Battle of Kawanakajima, Shigenaga's contingent was in the vanguard led by Kakizaki Kageie. Banners with standard bearers are from the '100' book. The uma-jirushi is my interpretation of the banner in the color plate in Turnbull's 'Samurai Warlord'. The sashimono is speculative based on the uma-jirushi. Hello Evalerio, I know you're still working on the Hojo of Odawara Banner and its vassals, by any chance have you come across the banners of Katsurayama Magoshiro? He is one of the generals under Hojo Soun who invaded Kai for the 3rd time in Sept 1503. Eventually Katsurayama Magoshiro died in this battle. Thank you. Using the phonetic alphabet, the Red Devil clan is not spelled L I (Lima, India). It's spelled with two i (India, India). 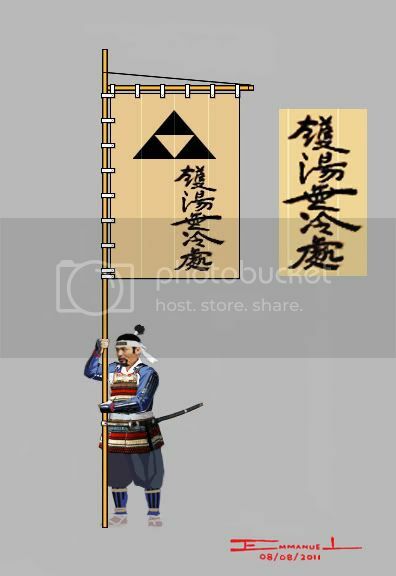 Both Honda and Tokugawa illustrated in the links above in 'O uma-jirushi' represent the final look of their banners, Sekigahara 1600 and beyond. They appear to look different in earlier times (Mikatagahara and earlier). ... which will include four contingents, Li Noamasa, Date Masasume, Honda Tadakastu and Tokugawa Ieayasu. With the right spelling you will be able to find what you need via google. Also try the japanese characters for image search. Looking through photos and videos of the Hojo Odawara Godai Matsuri, I recently saw the flag below. While most Hojo flags on display look like present day reproductions, clean and crisp. The one below look old and worn. It may have been white once, but it looks to have browned with age, darkened with stain and dirt. It is usually displayed close to the reenactor portraying the Hojo daimyo during the parade. Flown beside a red Hojo uma-jirushi, I am assuming this flag was flown by Hojo Ujimasa. Did I write the characters correctly? Could anyone translate it? I think the third character is 'nothingness'?. This character appears on three different Hojo uma-jirushi. Kakutô mu Reijo Kettle's hot-water has-no cold place. The hot water of a kettle has no cold. A Zen saying used in tea gatherings. I am not sure of the significance. Perhaps it means you should be single-hearted. But 鑊 is an unusual character for kanae (kettle). It is a large kanae used for boiling large amounts of meat or fish, or for boiling criminals! I am not sure of the relevance of that, though. By the way, a tea kettle is usually a different word, kama 釜.
Holy cow! I just saw the new Hojo illustrations and they are incredible. When is your book going to be out? I must have a copy.